You can create SoundCloud account for free from any web browser available on your device and also use responsive SoundCloud mobile application available on both Android and iPhones. How to create SoundCloud account? SoundCloud is a popular music and podcast sharing platform that lets users stream and share unlimited music. 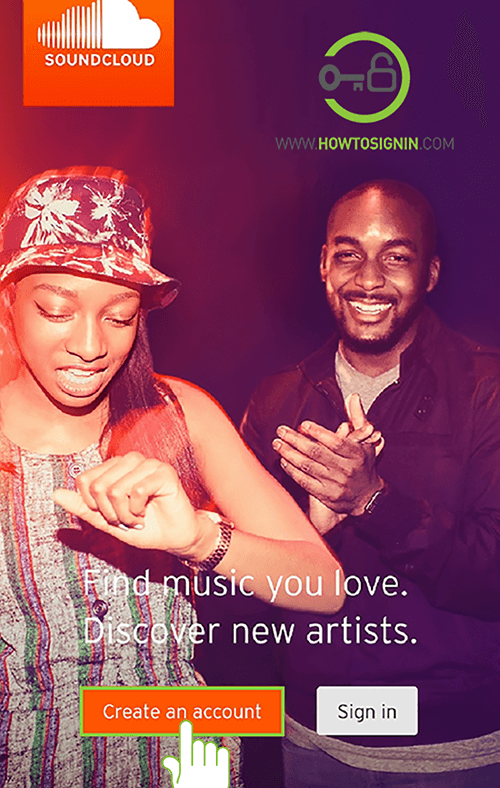 It is a social music platform sorely designed for the music enthusiast. With more than 175 million unique monthly visitors and 12 hours of audio uploaded every minute makes the SoundCloud next big things on Global social music sharing platform. It is a productive service for both artist and fans. Artist to share original audio tracks to their fans and audience to stream unlimited music tracks of their favorite artist. It provides a platform for the creator to record and easily upload your original audio tracks and podcast to reach your fans and also share the tracks to other blogs and social media to reach the vast mass of audience. Listeners can stream unlimited music and audio tracks of your favorite artist, and you can be a curator to establish your own following, building playlist and share to your followers. 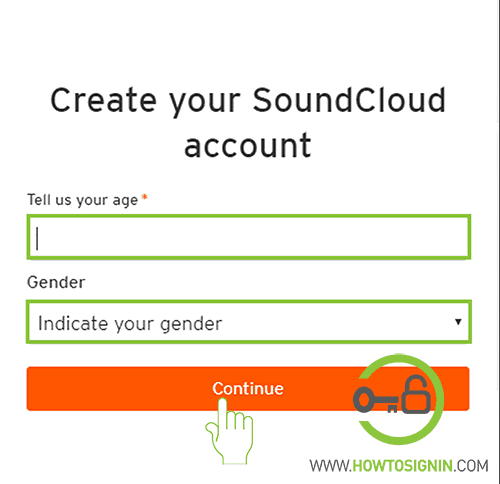 Creating a SoundCloud account is free. You can stream unlimited tracks online for free, but you’ll be served with ads. So it cost nothing to listen to music on SoundCloud if you don’t mind some ads. To stream ads free music and get offline access to your favorite audio tracks you can purchase SoundCloud Go+ package that will cost you $9.99/month, you can try it free for 30days before buying the package to test if it fits your expectation. For the artists who want to share their original audio tracks with their fan, upload limit is just 120 minutes for basic accounts which is free of cost. You need to upgrade your account to SoundCloud Pro for $72/year ($8/month) giving 6 hours of upload time and SoundCloud Pro unlimited for $144/year ($16/month) giving unlimited upload time. Sign up for SoundCloud account for free from web browser available or SoundCloud mobile application available on both Android and iOS platform. 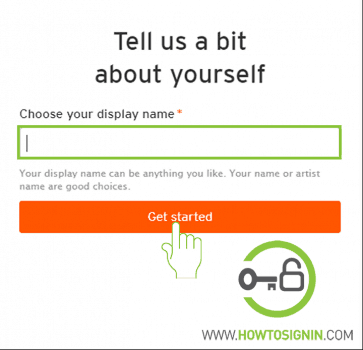 Email address, password, and few personal details are essential for SoundCloud signup. 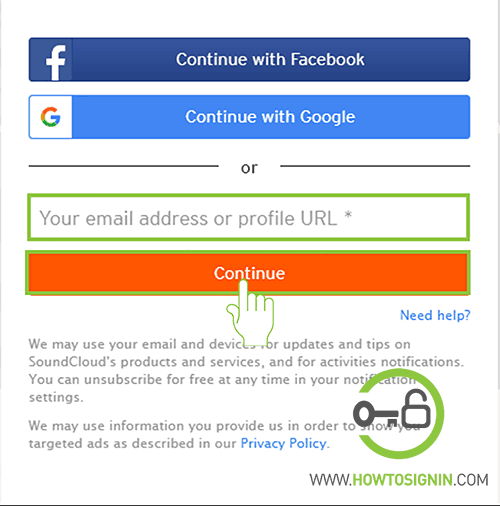 You can also use your Facebook or Google account for SoundCloud registration, which makes the signup process even quicker. Step 1: Go to SoundCloud homepage from any web-browser and click. 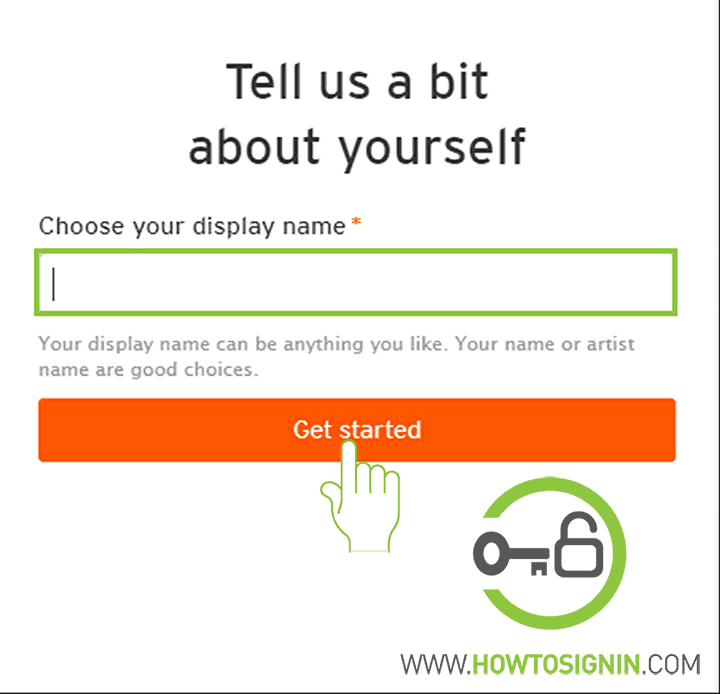 Step 2: Click on Sign up for free in the middle of the page or click on Create account. 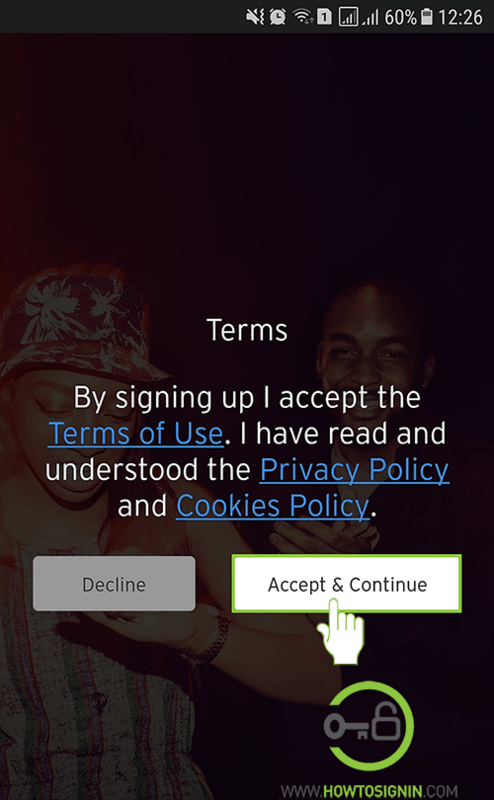 Step 3: After signup box pops up, enter your valid email address and hit Continue. You can also create a new SoundCloud account with Facebook or Google account. 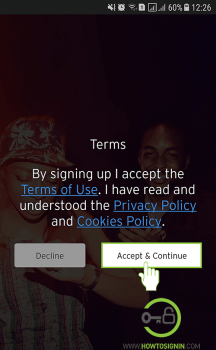 Just Continue with the respective button. Step 4: In the next step you need to choose a password for your new SoundCloud account. 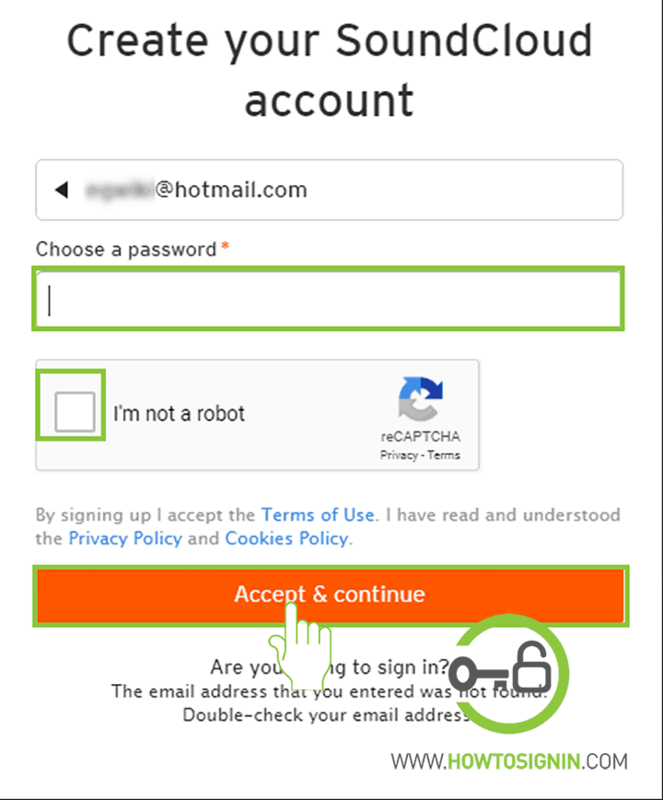 Step 5: Solve the captcha code by checking the box ‘I’m not a robot’ and click Accept & continue. Step 6: Fill the necessary information in the respective fields. Provide your age and gender from the drop-down menu. If you wish to keep your gender secret, choose to Prefer not to say from the option. Step 7: In the final stage, Enter the name that you want your display name to be. The display name is not compulsorily your real name. It can be your nickname or anything you like. Preferably use your own name so that others can identify you easily to connect with you. Step 8: Finally hit Get Started to complete SoundCloud registration. Download and install the SoundCloud app from Google Play Store on Android devices and App Store in iOS devices. Open the app and tap on Create an account at the bottom of the app. 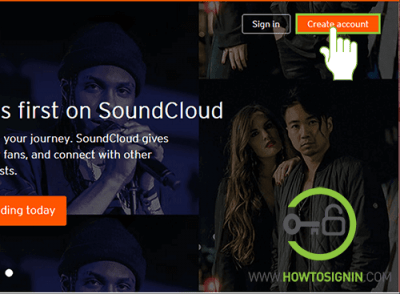 There are three ways of creating your new Soundcloud account. You can either use your existing email address or Facebook or Google account to sign up SoundCloud account. 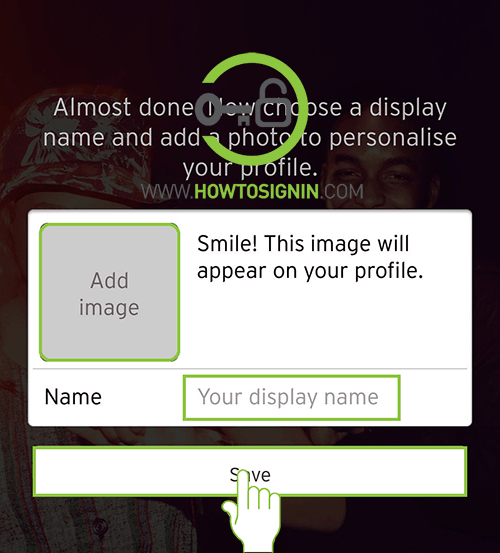 Just tap on ‘Sign in with Google’ or ‘Sign in with Facebook’ button. To register using your existing email address, tap on Sign up with your email address. 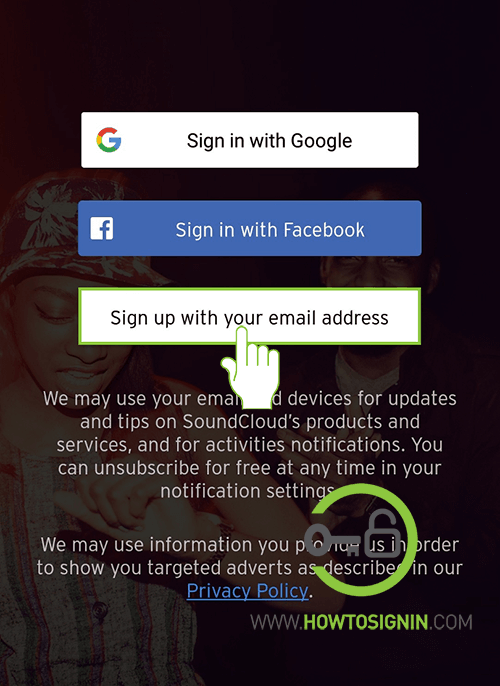 Now enter the email address you want to use for SoundCloud account. Enter the password for your new SoundCloud account of at least six characters. 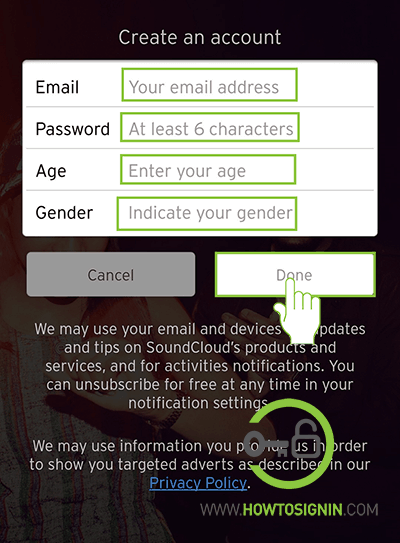 Fill the Age and Gender field with your information. Finally enter your display name, upload profile picture and tap on Save to complete SoundCloud sign up process using the mobile app.